I’ve always thought about this novel as a description of Dante’s Limbo – somewhere you are stuck through no fault of your own – the guiltless damned, as Dante describes it. And what worse punishment than to lose your identity without finding a new one? I haven’t read Dante’s Inferno, but from what I know of it, your description sounds spot-on. Transit really captures how terrible it must have been for these refugees to be trapped in a never-ending paperchase through now fault of their own, as you say. The other thing that struck me was just how quickly the rules of the game could change without a thought or care for the plight of these people – how a new regulation or requirement could be introduced at the drop of a hat. It must have been a truly heartbreaking experience. Heart rending read by the sound of it . I wiuld be interested to hear about the after forward written by Heinrich Böll , a fave GERMAN writer of mine who’s is in my sights this month !! Very much so, Helen. I think you’d appreciate this book, and it strikes me as being right up your street. Heinrich Böll’s afterword is very interesting, and his sympathies are definitely aligned with the refugees. He’s quite scathing about the authorities (consulate officials and travel bureau employees for example): having ‘tasted a bit of power with his tongue’ the official ‘liked the taste of it.’ I think Böll is quoting Seghers’ text here, but he’s on board with the theme. There’s a brief discussion of the politics and how it took too long for Seghers’ books to appear in the West. Plus a bit of analysis on the novel of course – you’d like this one for sure. If you’re interested in discovering more, Guy’s review contains some important context on Seghers herself, and it’s well worth reading. It is a trip into a bureaucratic nightmare, and there’s so much to say about this book I feel I’ve barely scratched the surface here. You’d like this one, Stu, and I’m sure you’d be able to put it into a broader context by drawing connections with other works. Which ones, Stu? I’d be interested to hear. Ah yes, Kafka is the obvious one. In fact, in his introduction to Transit, Peter Conrad draws a comparison with Josef K as he tries to get the officials in the castle to recognise his credentials as a surveyor. I definitely want to read more by Claudel, and I should try Herta Müller. Thanks, Stu. A perennially relevant theme, sadly. I really like the way that you dug into the text and looked at the underlying themes here. Identity and destiny, mythical and Biblical themes make this sound like a book that I would really like. I cannot help to think of all the people who, even today, have lives that are dependent upon navigating a bureaucratic maze. Thanks, Brian. There’s a lot to say about this book and I feel as if I’ve barely scratched the surface here. I think you’ve already seen Guy’s review, but it contains some fascinating background on Seghers and her own experience as a refugee. Also, Guy digs into events prior to the narrator’s arrival in Marseille with some chilling quotes on the experience of a country on the move. The identity theme is an interesting one. It’s as if the narrator doesn’t have a sense of his own identity other than that defined by a set of documents…and these papers will determine his destiny. There is something mythical and allegorical about this story. In some respects, I think Marina’s comment comparing the novel to Dante’s Limbo is getting at this point. I can’t quite put my finger on it, but there’s a sense of another layer to this novel, something going on under the surface that I couldn’t see. That’s why I’d like to read it again at some stage. It’s a fascinating book, I can’t recommend it highly enough. This sounds interesting and still very relevant to people trying to leave war torn countries today, I would have thought. Lovely review Jacqui and thanks for the link. This is such a wonderful book – very deep and involving and I’m sure I’ll revisit it one day. Thanks, Karen, and you’re very welcome. I don’t know how I missed your review at the time…maybe I hadn’t found your blog at that stage? I got totally caught up in this one and felt there was a deeper level to it. Something under the surface that I couldn’t quite see or piece together.. Yes, maybe you weren’t reading me then! I know what you mean about the deeper level – I think this book was saying a lot about the human condition but it probably needs at least one more read to get to it! Quite possibly, as I’ve discovered several new (as in new-to-me) blogs in the last five months or so. That’s interesting – definitely a novel to revisit! This is my favorite Anna Seghers book – I prefer it even to The Seventh Cross. The atmosphere in the unoccupied part of France and specifically Marseille, the claustrophobia and kafkaesque situation of the trapped emigres (that Seghers herself had to endure) is a really haunting reading experience. I read the book together with Varian Fry’s Surrender on Demand and Lisa Fittko’s Mein Weg ueber die Pyrenaeen. Seghers’ book is also a reverence to the Mexican diplomat who saved tens of thousands of lives by issuing Mexican visas to anybody who needed it – while the Chilean diplomat Pablo neruda scanned carefully the applications and rejected all visa to anybody who had ever written a critical word about Stalin, the Moscow trials or the NKWD (for which he worked as a henchman). Yes, ‘haunting’ is a very good word for it. I think that’s what I was getting at with my comment about the ghostly feel to the atmosphere in Marseille. The opening section is very chilling, too, and I probably could have written more about the narrator’s time in Paris and journey to Marseille. Thanks for mentioning The Seventh Cross, and I hope NYRB (or another publisher) picks it up off the back of Transit. I’m not familiar with either of the other two you mention so I’ll take a look. Both books are non-fiction. Varian Fry organized the escape of many writers and intellectuals. The book title |Surrender on Demand| refers to the agreement between Vichy France and Nazi Germany that Vichy had to surrender on demand any person the Nazis had on their long list of enemies from the so-called unoccupied France. That made the escape from Marseille such an urgent and desperate matter. Lisa Fittko was a refugee that was guiding groups of refugees through the Pyrenees to Spain. I found both books to be really breathtaking. Many thanks for the follow-up information. They sound like important companion pieces to Transit.. I confess I’d never even heard of this book before. From your absorbing description it sounds as if I really ought to add it to The List. A perfect choice for German Literature month. I recently watched Casablanca which touched briefly on the subject of refugees trying to leave and two Germans who were murdered for their transit visas. I thought of this book, of course. It’s not one you forget easily. I’m so glad I read this for German Literature Month. It caught my eye last year when I saw it the staff recommendations in Foyles, and it’s NYRB of course. Funnily enough, I revisited Casablanca the other week for precisely the reason you mention. Transit really lifts the lid on the whole web of bureaucracy and detached nature of officials dealing with refugees, doesn’t it? An absolutely unforgettable book. I’ve now decided to add a second category to my CV as a reader. This is for books I haven’t read but because of others’ reviews I feel I can speak about them as if I had. It’s a more sophisticated version of “How to bluff books you haven’t read.” Thanks, Jaquiwine and other book bloggers, even if you do add to my books-I-must-read panic attacks. Haha, I like it! Well, as much as we’d like to, we can’t read all the books.. Many thanks. I’ll take a look at your review, yodcha. Oddly enough, I revisited Casablanca once I’d finished reading Transit and watching the film again felt a little eerie in light of events in the novel. I seem to click with the NYRB titles, and I’m struggling to think of any disappointments (although I know you were less keen on Speedboat). I wonder who curates their list? Whoever does it seems to have very good taste and a knack for picking noteworthy books. Glad to hear you like the sound of Transit and I hope it’s still high on your list by the end of the month. (I’ll consider it payback for those Spanish Lit books I ended up buying off the back of your reviews in July!) 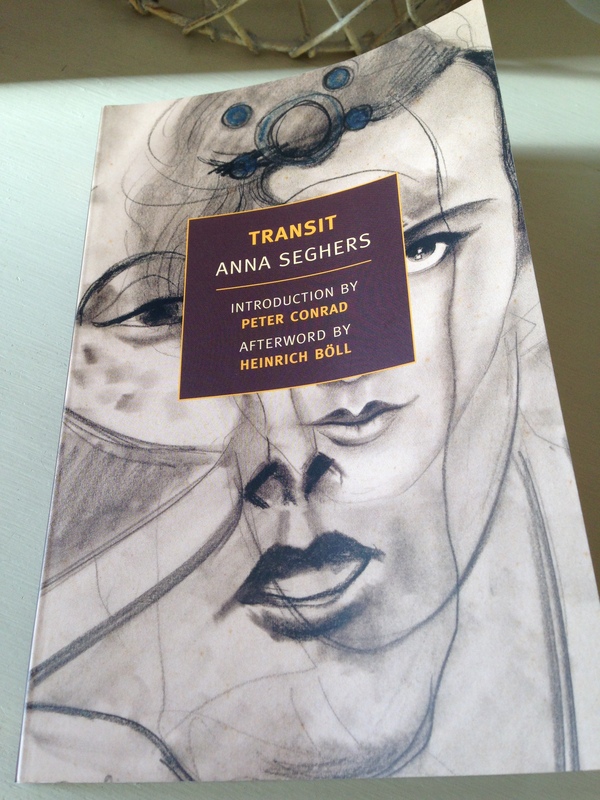 It does offer a remarkable insight into the horrors and frustrations of the transit process, and Seghers’ own experience makes it all the more powerful and believable as a novel. If you’d like a different view though, you might want to take a look at Tony’s review. I can understand some of his frustrations with it although I thought Seghers’ decision to use a circular structure and elements of repetition might have been a deliberate one as it emphasises the seemingly endless maze of bureaucracy. I hope to read this one someday, Jacqui, so I’m glad to hear you liked it more than Tony did (a lukewarm review as I recall). Sounds up my alley, but that NYRB cover is so off-puttingly ugly–one of their worst! It’s a remarkable story, Richard, one that will haunt me for some time I think. You’re right – Tony was less enthusiastic about it, and I can understand some of his frustrations with the novel’s pace. Nevertheless, as I mentioned to Grant in the comment above, I wondered whether Seghers’ had made a conscious decision to use a circular structure and elements of repetition. To my mind these elements only served to amplify what it must have been like for these refugees to feel trapped in a never-ending circuit of bureaucracy. And the despair of having to start the process all over again if any of their documents expired. Just awful. The cover is a strange one, isn’t it? I must admit to being quite intrigued by the image, and it probably does speak to some of the book’s themes, especially the shifting identities and somewhat ghostly feel / atmosphere. You’ll just have to cover the jacket with wrapping paper, or look for a different edition! Great review, Jaqui. I have read The Seventh Cross and her short stories which are impressive too but this sounds like a book I would love even more. I’ve got it after reading a book about German writers in exile, should just get the time to read it. Thanks, Caroline. Oh, I think you’d really appreciate Transit, and I’d love to hear your thoughts on it. I must track down a copy of The Seventh Cross (maybe for next year’s GLM if you’re thinking of hosting it again). The book on German writers in exile sounds fascinating, and I saw Marina Sofia’s review of it last week. I hope it gets picked up for translation at some point. Great insightful review as always Jacqui… I’d like to read this one to examine in particular how she uses the structure to represent the frustrations & repetitious beurocracy… but also to feed my curiosity to see what plays out between the protagonist and the woman in the cafe. Very welcome, Caroline. I’m a big fan of this book, so it’s always nice to introduce it to another potential reader. I don’t think it’s as well known in the English-speaking world as it deserves to be. I found it really involving.